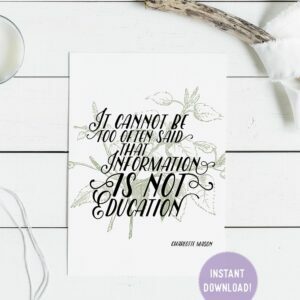 Get your homeschooling area or room in the spirit of fall with this print featuring Charlotte Mason’s educational motto: “I am. I can. I ought. I will.” This quote is printed on lightly textured 100% cotton paper with gallery-quality vibrant colors. Please note that this is a print that is shipped to you. For the downloadable option that you print at home, click here!